How much longer will it be until we lowly humans are rendered obsolete, overtaken by something which they created? While you ponder that, take a look as this charming medical robot playing the popular board game Operation. The idea comes from Johns Hopkins University Ph.D students Carol Reiley, Tom Tantillo and Kel Guerin. The students, all studying a form of computer science, appear to have created the video as a bit of fun, using a machine they use regularly. 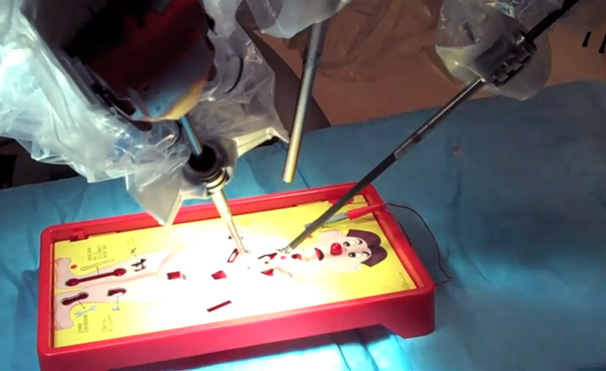 The Da Vinci Robot is meant to carry out delicate and complex procedures in real human operations, but the trio saw its microscope and tiny hands as a good tool in playing games too. Watch as the robot picks out the plastic game pieces with precision, and imagine having two of these to play Operation with. Plus, unlike a lot of intelligent robots, Da Vinci requires a human to control it, so you can play properly too. A child's game made cool and you can join in? Win-win situation. A YouTube member pointed out that playing with the robot's hands and not the apparatus supplied with the game essentially breaks the circuit needed to play properly. Good point, but it still must be cool to play with surgical robots rather than those annoying game tweezers.